Out of darkness floats the throaty warble of woodwind. The sound reverberates and repeats. When the lights come up, they catch things in mid-action: A flock of female dancers in floor-length dresses sway and undulate in unison upstage; two bare-chested men spin away as if swept up in an eddy. 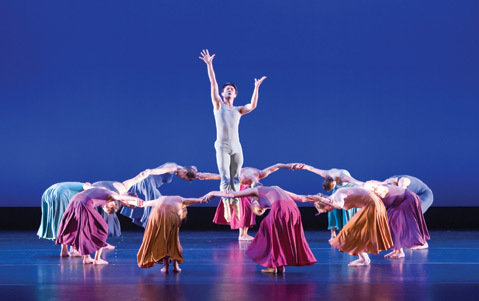 The work is “Deep Currents,” choreographed by UCSB faculty member Nancy Colahan and set to a gorgeous, layered score commissioned from composer William Pasley. Like so much of Colahan’s work, “Deep Currents” is carried along on a lilting idiom of over-curves, sweeping circles, and soft arrival points. Yet in this performance as never before, the 12-member UCSB Dance Company appeared fully professional: a tight ensemble, focused, assured, and fully immersed in the essence of the work. It was a powerful opening to a powerful evening of dance from these senior dance majors, whose Center Stage program included works by department faculty — from Valerie Huston, the somber female solo, “Black Earth”; from Christopher Pilafian, “The Space Between Us,” a searching duet in which man and woman reached for each other and narrowly missed, embracing empty space instead. Jerry Pearson’s 1999 group work “Strange Boat” got new treatment from director Delila Moseley, who swapped the original flowing white costumes for sleek black bike shorts and more exposed skin for a sexier — though still playful — result. 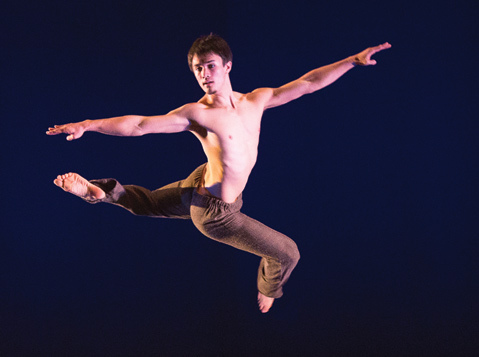 With this program, the 12 members of this year’s UCSB Dance Company proved their technical versatility — a skill that’s crucial for success in today’s dance world. Even more importantly, they showed their ability to dive deep into the matter of each new work, seek out its spirit, and bring it alive onstage.